A note on food composition; List of figures; Dictionary; Appendix: Table 1 Units of physical quantities and multiples and submultiples of units; Table 2 Labelling reference values for foods; Table 3 US/Canadian Recommeneded Dietary Allowances and Acceptable Intakes, 1997 – 2001; Table 4 EU Population Reference Intakes of Nutrients, 1993; Table 5 UK Reference Nutrient Intakes, 1991; Table 6 Recommended Nutrient Intakes for Vitamins, FAO 2001; Table 7 Permitted food additives in the European Union; Table 8 Nomenclature of fatty acids. The study of food and nutrition covers many disciplines, ranging from agriculture, biology, physics and chemistry to food technology, nutrition and medicine. As research on the links between food and health continues to expand, it is more important than ever that specialists in such areas as food processing and nutrition be familiar with the often unfamiliar terminology that differing disciplines use. This classic book meets that need. 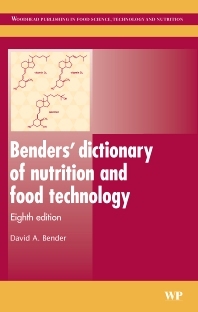 It provides succinct, authoritative definitions of over 6100 terms in nutrition and food technology (an increase of 20% from the previous edition). The book also includes nutrient composition data for 340 foods and an appendix with nutrient intake and other useful data. David Bender is Senior Lecturer in the Department of Biochemistry of University College London. The late Arnold Bender was Emeritus Professor of Nutrition in the University of London.